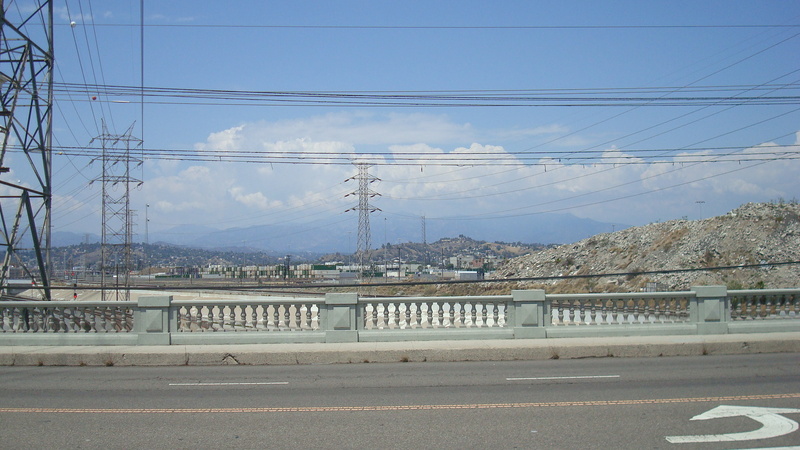 Looking north from the Cesar Chavez Avenue Bridge. A while ago I took a walk across the Sixth Street Bridge to get some photos of it before they tear it down. 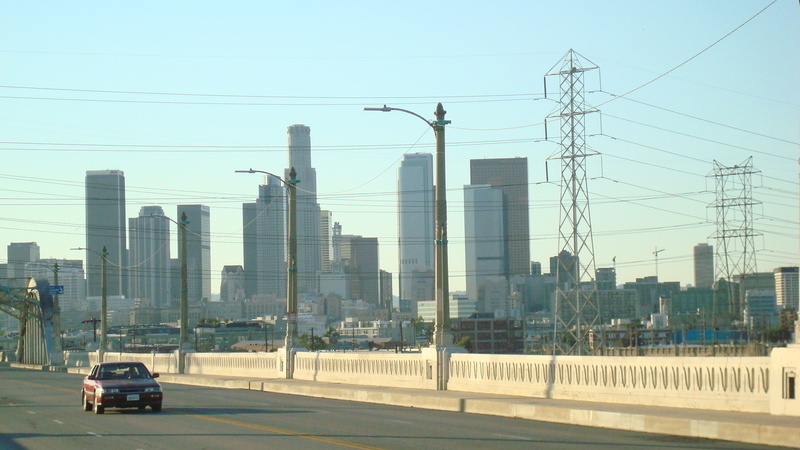 Looking out over the landscape, I saw the other bridges that span the LA River, linking Downtown and East LA. I started thinking it would be cool to take pictures of them as well. I started walking on the Downtown side of the bridge. 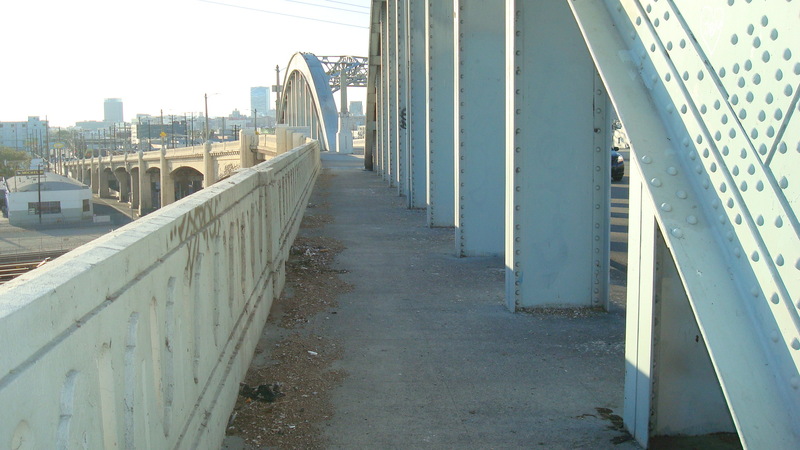 It’s taken me forever to get started on that project, but recently I took a walk across the Cesar Chavez Bridge. There is something kind of thrilling about seeing the surrounding area from that vantage point. Much of the landscape is hard, grey concrete. Power lines criss-cross the sky. But you can also see the hills in the distance, and on the day I crossed the bridge there were massive clouds billowing all along the horizon. A view of the First Street Bridge. 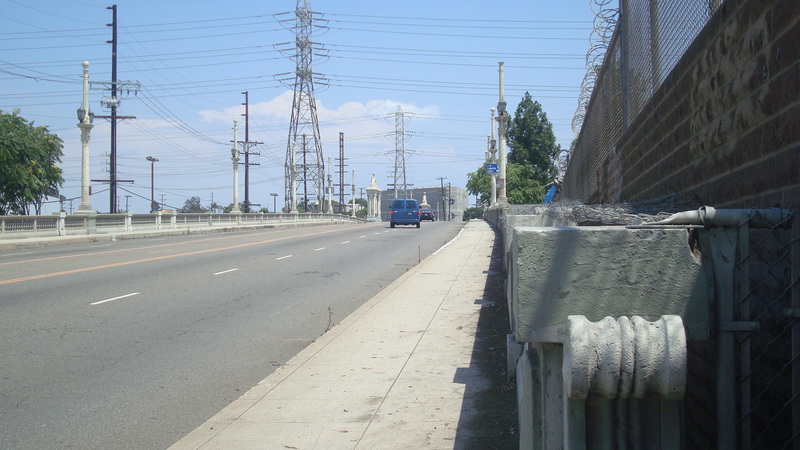 Today the bridge is part of Cesar Chavez Avenue, created back in the nineties to commemorate the courageous labor leader who helped organize California’s farm workers. 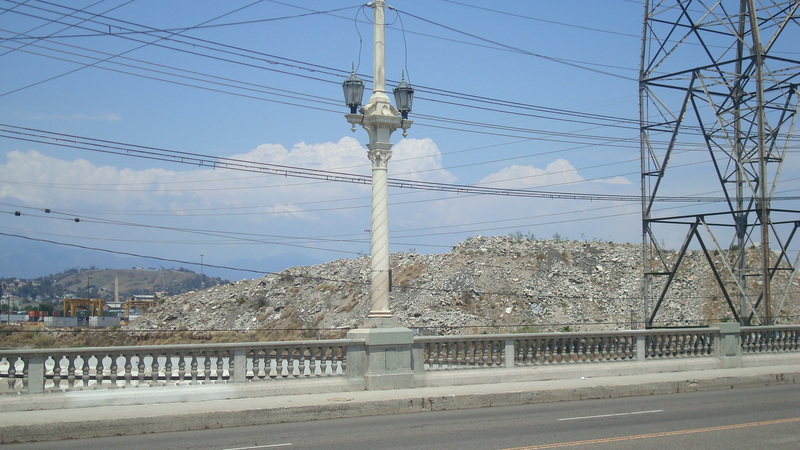 The segment that includes the bridge was formerly called Macy Street, but it’s also part of the historic Camino Real, the road built by the Spanish to connect their missions back when they governed California. The first bridge built on the site was erected in the nineteenth century, but it was demolished at the beginning of the twentieth. 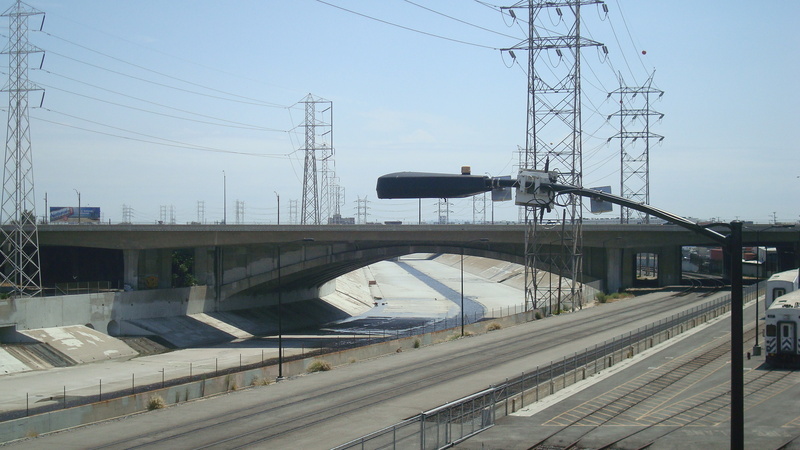 In the twenties, the City of LA began an effort to construct a series of viaducts across the LA River, and this bridge, then called the Macy Street Bridge, was part of that effort. A huge mound of debris on the north side of the bridge. For years I’ve seen this massive mound of debris resting on the north side of the bridge. I have no idea where it came from or if it’s ever going away. If you look closely you can see that plants have started to grow here and there. It’s become part of the landscape, an artificial hill rising up over the river and the rail lines. 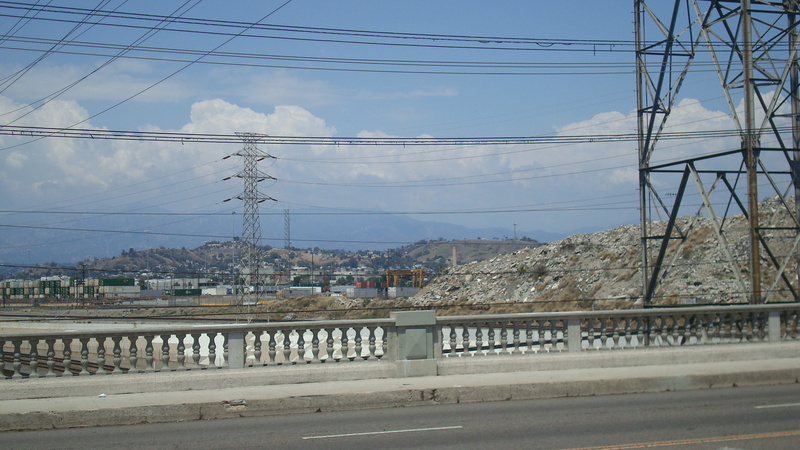 A view of the bridge heading toward East LA. 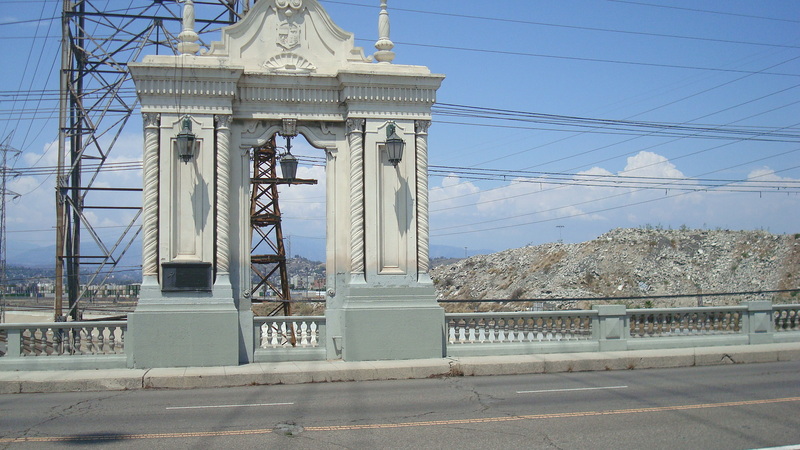 The bridge is lined with lampposts on either side, and decorated with porticos ornamented in the Spanish Revival style that was popular in the twenties. There are plaques affixed to the porticos explaining that the bridge is dedicated to Father Junipero Serra, the founder of the California missions. Serra’s legacy is controversial, since he was a major player in Spain’s effort to subjugate the native population. The Vatican’s recent decision to canonize him has ignited the debate all over again. 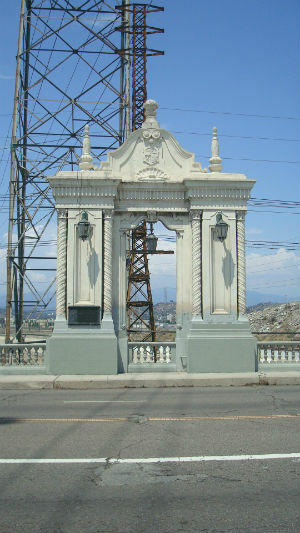 One of the porticoes that decorate the bridge. Another view of the same portico. 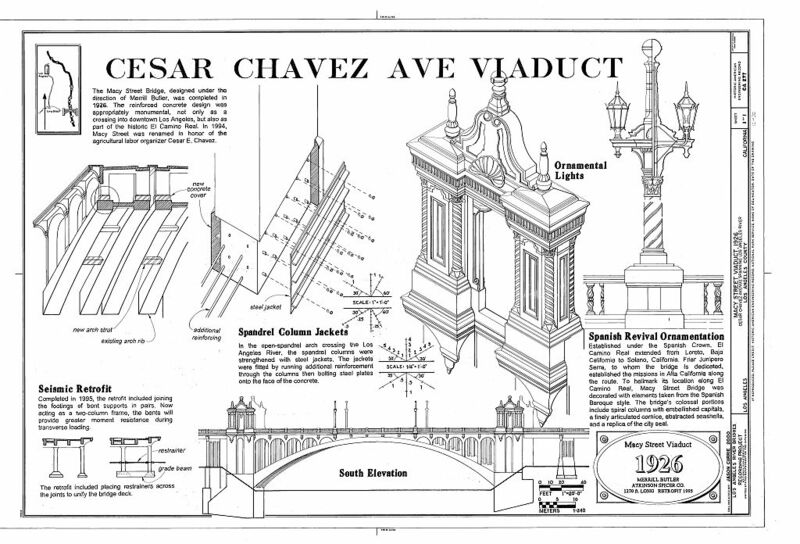 If you want to learn more about the Cesar Chavez Avenue Bridge, below is a link to an article on KCET’s web site that talks about the origins of a number of LA bridges. To see more images and to access info about it’s history, check out the links to the Library of Congress. There were two things I’d been wanting to do for a while. 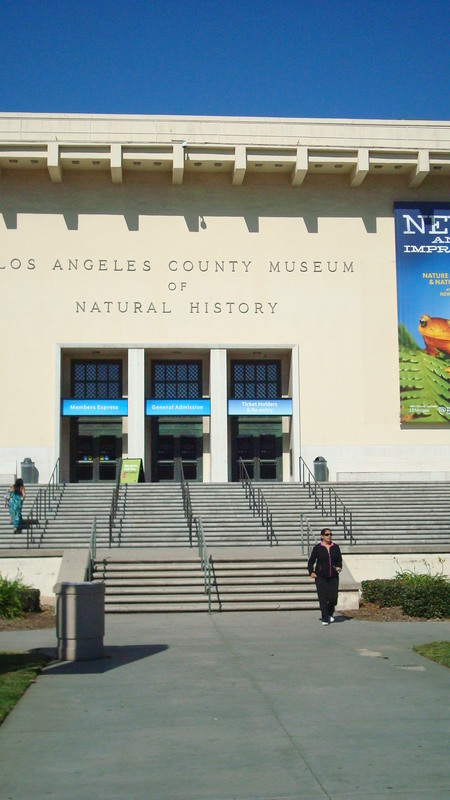 The first was to visit the Natural History Museum to see their show on LA history. The second was to take some photos of the Sixth Street Bridge, which is slated to be demolished and replaced, although that may not happen for a while. So Tuesday morning I took the Red Line down to Seventh and Figueroa, where I transferred to the Expo Line. Pretty soon I was standing on the platform at the Exposition Park station. It might have been twenty years or more since I’d been to Exposition Park. Walking toward the fountain at the center of the gardens was sort of like walking into the past. In part, that’s because of my memory of visiting the museums as a child. But also, the three buildings that border the park are massive reminders of the ornate, imposing architecture that was considered appropriate for museums a hundred years ago. In fact, the Natural History Museum is celebrating its one hundredth anniversary this year. Their web site offers a brief history, which you can read by clicking here. The photo above shows the current entrance to the museum, which presents a modern facade. It’s an interesting contrast to the NHM’s original entrance, which is what you see in this next photo. The exhibition I went to see, Becoming LA, was really good. The curators did a nice job of presenting the area’s multi-layered history, weaving together the threads of all the diverse groups that made the city what it is. Of course Becoming LA is just the latest in the recent onslaught of shows about Los Angeles. 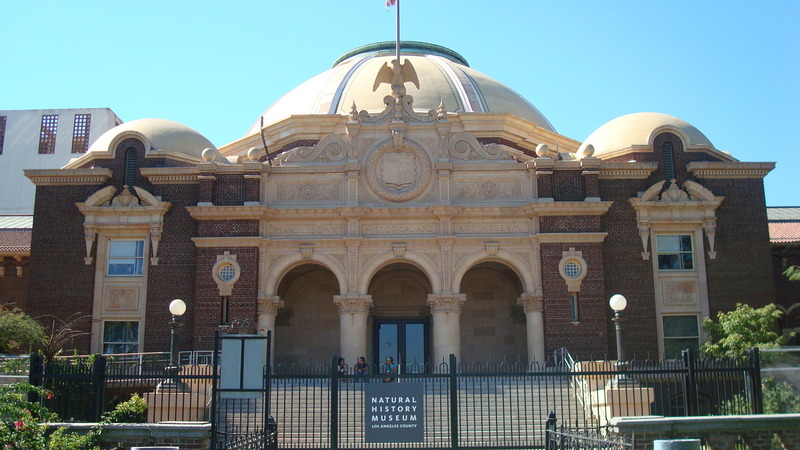 Local museums have been giving a lot of attention to the city in the past few years. I’m all in favor of highlighting LA’s art, culture, etc., but at times it seems like we’re crossing the line into bombastic self-promotion. Which, I guess, isn’t really that surprising. After I was finished with the museum, I took the bus north on Vermont to Olympic, where I had to transfer. This put me right in the heart of Koreatown. There’s an interesting vibe in many parts of Koreatown, which I think has to do with the zillions of small businesses competing for your attention. 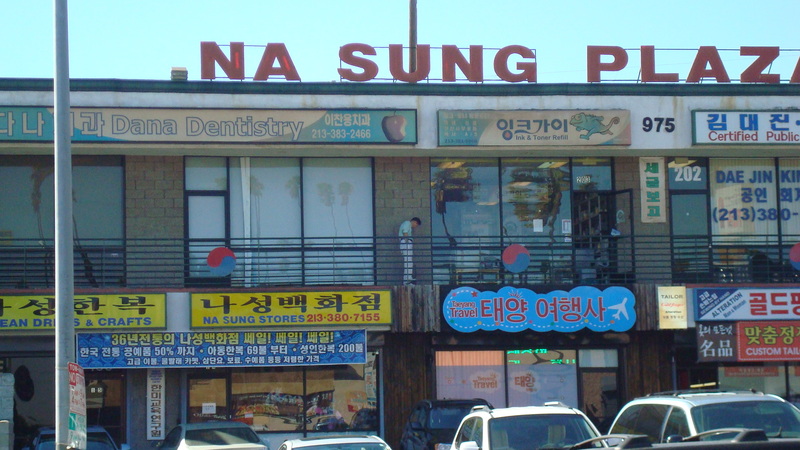 There are numerous strip malls, and they all seem to be bursting with restaurants, karaoke bars, tech retail outlets, nail salons, etc.. Here’s one example…. But the look of Koreatown is changing. 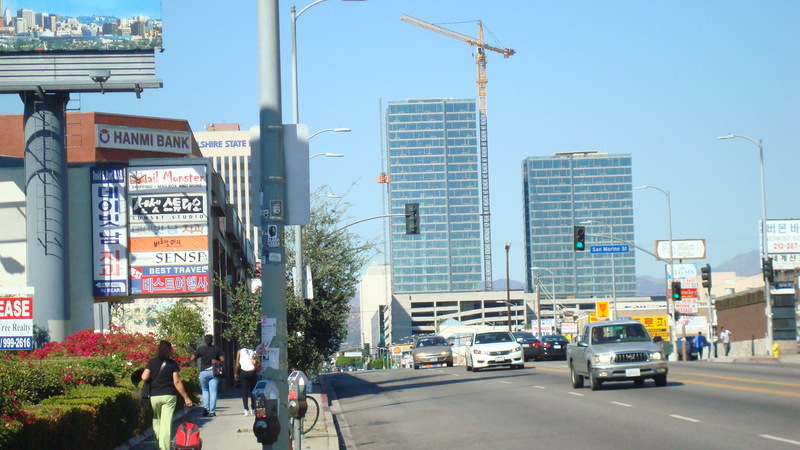 In the image below you’re looking up Vermont toward Wilshire, where you can see two high-rise towers that combine residential and retail. I understand some Koreatown residents aren’t too happy about the wave of high-density development that’s hitting their area. I doubt that bothers the City Council, though, and it certainly doesn’t bother Mayor Garcetti. They are all one hundred percent committed to serving the developers who put them in office. Click here for more info about this massive project. The bus showed up and I got on. A few minutes later I got off at the end of the line, Sixth and Maple. I headed up Maple and over to Wall. As I was walking along, I heard a voice behind me. He must’ve seen the camera I was holding. I laughed, but he had a point. The street was filled with people who were living on the sidewalk. The desperation was palpable. I can’t say I was really afraid, though. I spend a fair amount of time downtown, and I’ve walked through skid row now and again. If it was night, I probably would be worried. But in the harsh light of day, these people looked too beaten down, too demoralized, to be a threat. We walked along together for a block or so. I told him I had the camera because I wanted to shoot photos of the Sixth Street Bridge. He knew the bridge was going to be replaced, but he felt it would be a long time before work actually started. Somehow we got talking about the LA City Council, and we both agreed they have absolutely no respect for the law. Interesting how the one thing that seems to bind Angelenos together is our absolute distrust of the people at City Hall. Then we went our separate ways. I headed over to Little Tokyo for a bowl of udon and a beer. Then I started walking down Central to Sixth. It was late afternoon. The streets were mostly deserted. There were few cars and fewer people. I walked past the Woori Market’s empty parking lot. It’s been closed for a while. There were large warehouses, like Los Angeles Cold Storage. A couple small restaurants. A lot of places have security fences, and a few were topped with barbed wire. The bridge rises up over the warehouses and the railroad tracks. As you get near the mid-point, the landscape below stretches out for miles in every direction. Here’s a shot of the bridge looking back toward downtown. 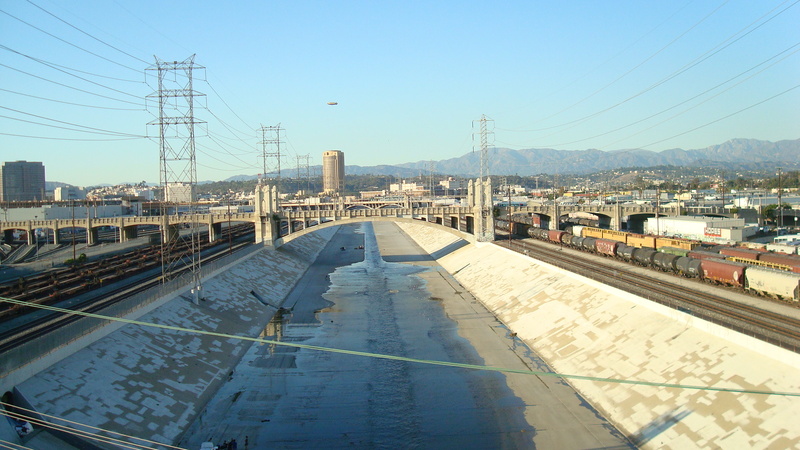 And here’s another looking down on the LA River. 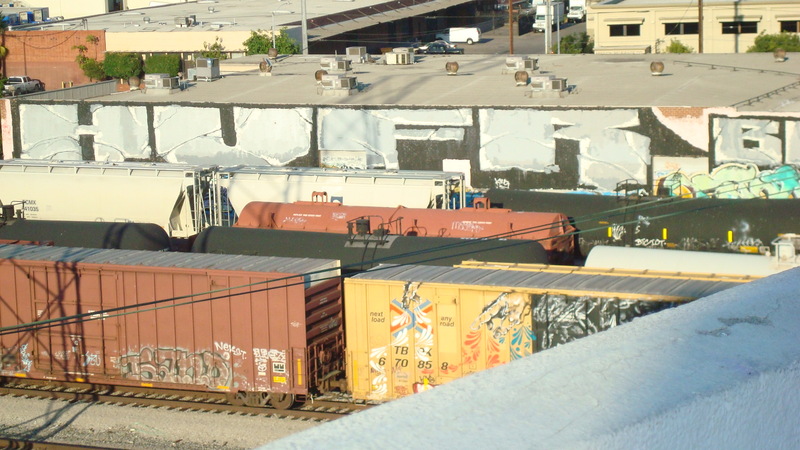 Freight cars covered with graffiti sit lined up below. And here’s another shot of the downtown area. 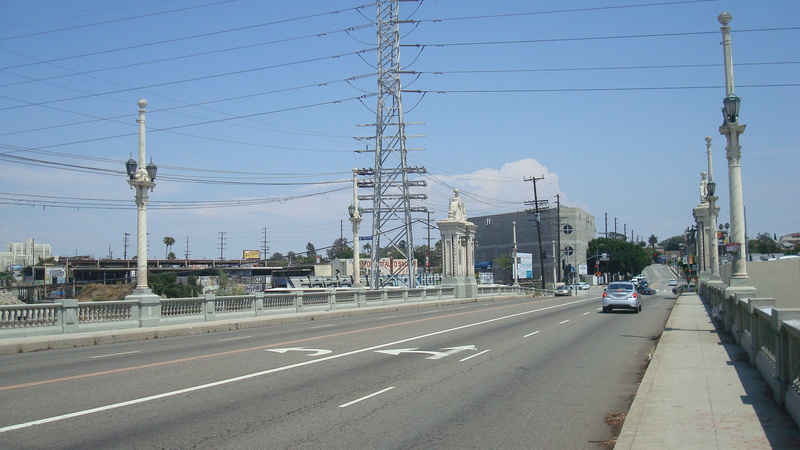 On the other side of the bridge, Sixth Street becomes Whittier Blvd., which leads you into Boyle Heights. I waited for the bus in front of Carnitas Michoacán #3, which seemed to be doing steady business. And then the seven twenty showed up to take me home.